Phoebe Rossman, a Kennedy-Lugar Youth Exchange and Study Abroad Program (YES Abroad) participant, is the U.S. Department of State’s April 2018 American Abroad Student of the Month. From Virginia, but attending school in Massachusetts, Phoebe is currently studying in Amman, Jordan. Phoebe goes to school every day excited to learn and determined to go above and beyond during her exchange year. Phoebe not only excels in her classes at Al Mashrek International School and in her additional language and culture classes at AMIDEAST, but she is always looking for ways to share her interests with her peers. In January, Phoebe led a book-binding workshop at her host school, teaching her classmates how to make sketchbooks, an activity that is one of Phoebe’s many passions. Photo left: Phoebe at Model UN. In addition to working hard in academic settings, Phoebe also engages in volunteer activities that allow her to connect with her host community. Phoebe volunteers with two girls’ classes and one boys’ class of the English Access Micro Scholarship Program. Last month, she planned and introduced a poetry unit in one of the girls’ classes to provide a creative way for the students to practice their English skills. Phoebe also volunteers at Seven Hills Skate Park in Amman, where she works with refugee kids, holding the hands of the younger kids while they skate and playing games with the older children. Most recently, Phoebe started volunteering at Mohammad and Mahera Abu Ghazaleh Foundation, a museum in Amman, helping to get their new recycling program up and running. Phoebe applied to be an artist in the Baladak 2018 Street Art Festival, an annual festival in Amman to celebrate artistic expression and beautify the city. 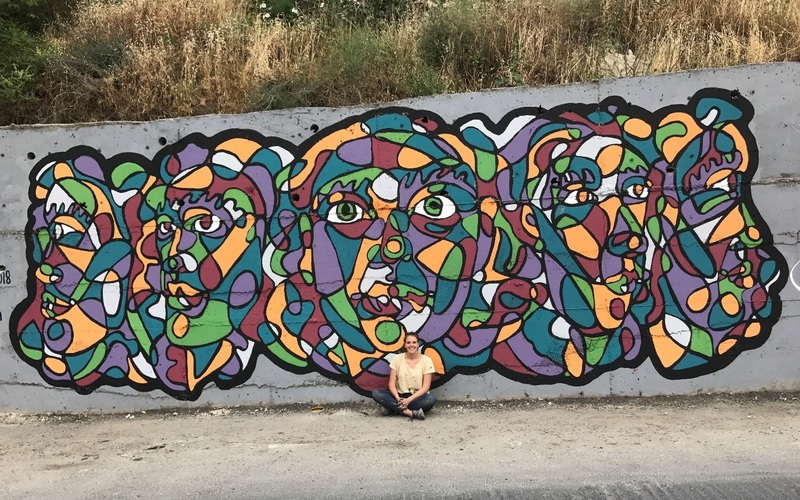 The theme of this year’s festival is “Humanity” and Phoebe’s abstract portrait design was chosen as a mural for a street in the popular Jebel Amman area. With some help from her YES Abroad peers, Phoebe completed the mural in early May. Phoebe undertakes all of these activities with an exemplary attitude. 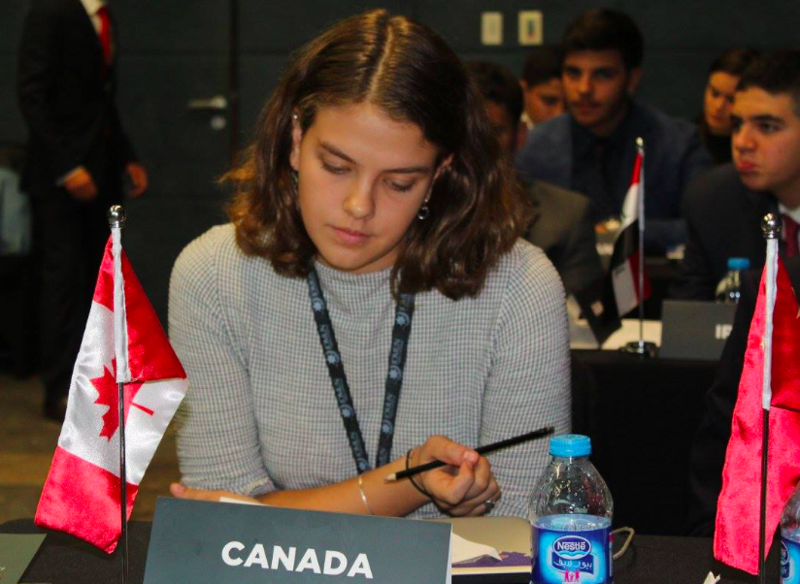 Her hard work and consistent kindness are just some of the characteristics that make Phoebe an outstanding exchange student and representative of the United States. 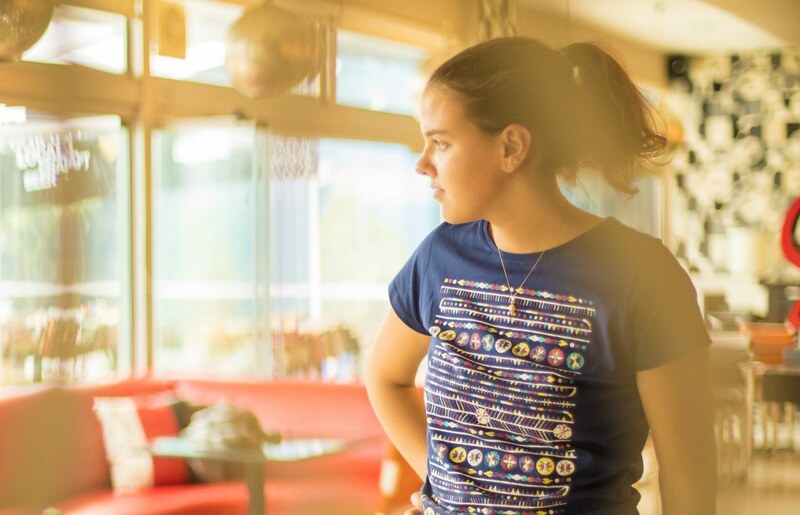 Phoebe has been a positive force on YES Abroad, trying to understand and connect with her Jordanian peers and community to the fullest extent. Photo above: Phoebe and her mural.